2008 Groundsman model 345HD Pedestrian Turf Aerator. This is a very fresh machine, privately owned and has done very little work. This machine has been factory refurbished with new crank bearings throughout. 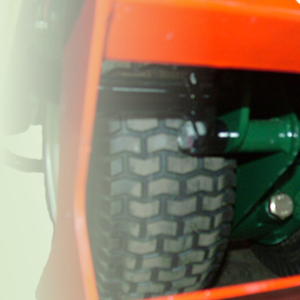 Comes with Twin Tine Holders fitted with solid tines. Groundsman model 460SDR Pedestrian Turf Aerator. Groundsman model 345HD Pedestrian Turf Aerator. Choice of three machines, each in same condition. Serial Number 8090128. 2001 Machine. Fully factory Refurbsihed (As new). Sandblasted and re-powder coated. All main bearings replaced in crank. Upgraded "A" Frame. 12 Month Factory Warranty. Groundsman model 345HD pedestrian Turf Aerator. This machine has been fully factory refurbished. Sand blasted and re-powder coated. Upgraded to HD Crank Mechanism. New crank arms and bearings fitted. New Engine and Clutch.